Today it is generally accepted that one of the key areas of biotechnology for the next century will be in plant-based biotechnology. Biotechnology has created new opportunities for plant scientists, with important applications to agriculture and forestry. This reference text is divided into five sections for ease of presentation. The first section focuses on the structure, composition and functionality of plant cells and genes with particular emphasis on the cellular and molecular biology of plants and cultured cells. Section two is concerned with the direct exploitation of cell cultures for the production of useful substances. The third section deals with regeneration and propagation systems. The fourth section considers the increasingly central area of genetic manipulation of plant cell systems. The last section is on specific applications in plant biotechnology. This reference work is a survey of these various facets of plant biotechnology. The individual chapters and the follow-up literature cited allow an easy access to the various subject areas and will, hopefully, stimulate interest in these rapidly moving and exciting fields of research. For universities and similar institutions which have departments of plant science; pharmaceutical, agrochemical and biotechnology companies; government and independent institutes where research in plant science is undertaken. Biology of Plant Cells. The cell biology of plant culture systems, G S Warren. The molecular biology of plant cells and cultures, C A Cullis. Systems for the Exploitation of Cell Cultures. Cell selection, W H-T Loh. Bioreactors for the mass cultivation of plant cells, A H Scragg. Immobilized plant cells, P D Williams & F Mavituna. 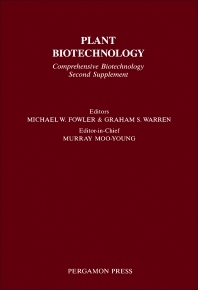 Plant cell culture, process systems and product synthesis, M W Fowler & A M Stafford. Regeneration and Propagation Systems. Plant regeneration from cultured protoplasts of higher plants, S J Ochatt & J B Power. Micropropagation: principles and commercial practice, R D Rice et al. Genetic Manipulation of Plant Cells. Plant genetic transformation, A G Day & C P Lichtenstein. Expression of plant genes in yeast and bacteria, N Overbeeke & C T Verrips. Protoplast fusion, H Morikawa & Y Yamada. Genetic engineering of plants and cultures, G Ooms. Specific Applications in Plant Biotechnology. Application of unconventional techniques in classical plant production, G Wenzel. Cell culture and recombinant DNA in plant pathology, G S Warren. Exploitation of chloroplast systems in biotechnology: stabilization and regulation of photosynthesis, C H Foyer & R T Furbank. Subject index.